As an aspiring home barista and self-confessed coffee nut, you’ll already be one of the 62 percent of Americans who enjoy some variety of coffee-based drink every day. Many younger coffee drinkers are switching to gourmet, with almost 60 percent preferring a specialist, gourmet brew to your bog-standard drip-brewed beverage. But did you know that cold brew coffee is rapidly becoming the drink of choice amongst many younger coffee aficionados, with sales growing exponentially year-on-year? So, what’s the deal with cold brew coffee and does it really have any benefits? Cold brew, iced coffee, nitro coffee … all the same animal, right? Well, for starters let’s clear up some confusion. After all, you want to know exactly what you’re ordering the first time you venture into the world of cold brew coffee. Let’s be clear about this, cold brew is not the same drink as iced coffee. Iced coffee is simply regular coffee that’s served over ice, either mixed with milk or left plain. Cold brew is made from coffee beans that have been steeped in cold water for 12 to 24 hours, rather like you would when using an oversized tea bag, but using coffee. It’s time, rather than heat that extracts the flavor, caffeine, and sugars from the coffee beans. The steeping process is more sympathetic to the coffee bean, so you don’t end up with the bitter flavor that roasting can produce. Okay, but what’s nitro coffee? Nitro is just cold brew coffee that’s infused with nitrogen gas (yes, really). The coffee is stored in a beer keg and then served on draft. The idea behind using what’s essentially a beer tap to serve the coffee is that it produces a creamier, sweeter flavor. When you draw a glass of chilled nitro, you get what looks like a serving of Guinness, complete with a foamy, creamy head. One absolutely essential thing to know is that nitro is never mixed with milk or ice – that would be a massive no-no and would certainly cause raised eyebrows and exclamations of horror in your local hipster haunt. You could even get banned. So, the bottom line; if you like your coffee strong, black, creamy and ice-cold, nitro could be the way to go for you. And New Orleans-style cold brew? Well, the same basic steeping process is used as for standard cold brew, but chicory is added to the grounds, giving the finished brew a sweet flavor. Milk and sugar or sweetener is added to give the end result a creamy, cold drink complete with a nice strong caffeine hit. Now you’re suitably informed, let’s look at what makes cold brew (and its variants) so good. Reputedly, drinking cold brew coffee has many benefits over a steaming mug of scalding hot Java. We cut through the hype to bring you the good, the bad, and the ugly of cold brew coffee. Thanks to the long steeping process, cold brew’s coffee-to-water ratio is reckoned to be approximately 1:60. This compares with the usual drip coffee ratio of around 1.20. Whoa! That’s a lot of caffeine right there. By way of an example, consider that a typical 16-ounce cup of Starbucks cold brew will give you around 200 mg of caffeine. However, a diluted 16-ounce cup of hot brew will give you between 260 and 375 mg of caffeine, depending on the type of beans and other variable factors as previously mentioned. So, you can see that although cold brew coffee is definitely caffeine laden, it doesn’t necessarily follow that your finished brew will give you the jitters for a week. If you need to sharpen yourself up mentally or physically, you just need a cup of cold brew that’s tailored to suit your individual physical make-up. Thanks to its high caffeine content, cold brew coffee can help you to lost weight. How? Well, by drinking a cup of cold brew or nitro following a workout, you’ll increase your post-energy expenditure, or after-burn effect. The after-burn effect is the term used to describe the body’s ability to continue burning calories after exercise. Regular coffee has this effect too, but just imagine how much more fat you can burn by increasing your caffeine hit with a cold brew or a nitro. And all from the comfort of your favorite armchair. The caffeine contained in a cup of Joe increases the flow of blood to your brain, thus boosting your cognitive function. Research carried out by the Human Nutrition Research Center on Aging shows that the bioactive compounds found in coffee can reduce cognitive deficits, as well as improving motor function. Although these tests were carried out on lab rats, it’s thought that the same effects are seen in people. And the higher the coffee content of the brew, the bigger the brain boost you’ll receive. The heat that is used when making drip coffee can produce a bitter flavor to the finished brew. Heat is not used at all in the process of making cold brew coffee, so the flavor tends to be smoother and the coffee is less acidic. For this reason, those who have sensitive stomachs or suffer from acid reflux generally tolerate cold brew coffee better. In addition, if you decide to make your own cold brew coffee, you can choose your favorite beans, depending on your own personal taste. Given that the end result is typically less bitter in flavor, you might want to try a few of the more robustly flavored beans that you would otherwise pass over. 5. Drinking cold brew coffee could extend your life! Exciting recent research claims that drinking a daily cup of Joe can be good for your health and may even lengthen your life. How come? Well, coffee increases the body’s fat-burning capabilities, increases insulin sensitivity, and decreases the risk of dementia – and it tastes great too. What’s not to like? Most of these studies are based around the antioxidant content of coffee. Antioxidants, especially chlorogenic acid, are the body’s natural anti-inflammatories, and coffee contains them in abundance. Although there are no studies specifically aimed at cold brew coffee, it’s thought to be likely that more antioxidants may be left behind after the steeping process, together with oils and acids. Therefore, it follows that cold brew could be even better for you than regular hot Java. Also, coffee contains more free-radical fighting chemicals than other caffeine-rich drinks such as tea. Free-radicals cause certain cancers, so the less of them in your body, the better. Coffee is reputedly the best beverage for anti-aging effects. That’s because of those antioxidants again. Antioxidants can help to protect your skin from harmful chemicals found in the air and from the sun’s damaging UV rays, helping to keep your skin supple, moisturized, and youthful. If you’re watching your weight but struggling to kick the sugar habit, cold brew, especially nitro is the best coffee beverage option for you. Let’s say that you usually add two sugar packets to your brew and you also take milk or cream. That adds up to about 70 calories. If you have several cups of coffee every day, all those extra calories can soon spiral out of control. Nitro is served without milk, cream, or sugar. That’s because it simply doesn’t need these additives; the nitrogen infusion that’s used in the creation of the coffee gives the end result a rich, creamy, sweet taste. Devotees of nitro even claim that it tastes rather like milk chocolate. So you can enjoy a creamy, sweet, chocolate flavored coffee, without jeopardizing your weight loss efforts. Just remember to pass on the pastries. 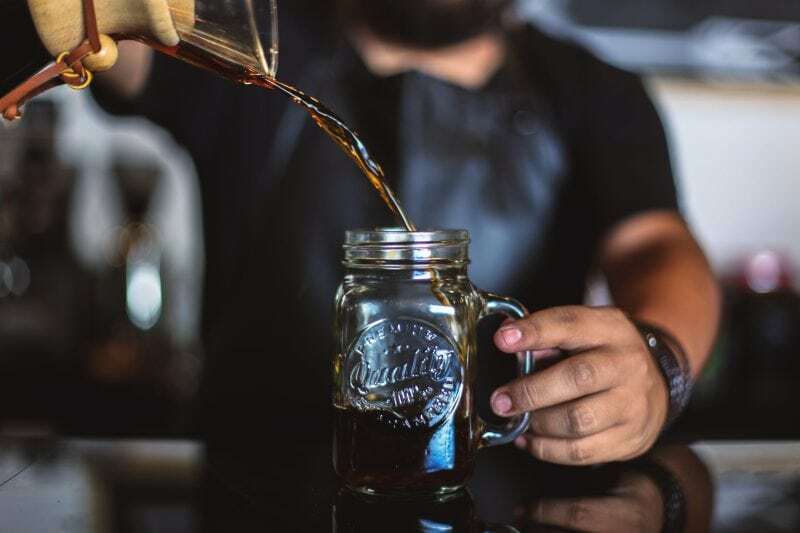 Drinkers of cold brew coffee, including its variants, can look forward to a longer life, sharper brain function, and a boost to their weight loss attempts. All this is thanks to the steeping process and in the way that this gourmet brew is created. You might want to check out a cold brew or nitro at your local hipster haunt, before you try this at home. The taste’s not for everyone, but if you want to catch the wave and be in with the in-crowd, cold brew is the way to go. Dude.